It is almost certain that a choir school existed in the fourteenth century, associated with the parish church. However it is not until 1547 when that the Crown Commissioners, in the wake of the abolition of Chantries, were travelling the county and reported that the Chantry attached to St John's church was being used as a school - "chapel scituate in the church yarde.... which the inhabitauntes ther desire to have for a scholehouse". The churchwardens' accounts of 1573 show that a sum, of £12 13s 4d (in excess of £20,000 at today's value) was expended in converting the chapel to a school which included a bedchamber for the master. It is not known how long this school lasted. In 1671 a Somerset parson, Henry Hartwell, born in Yeovil Marsh, bequeathed land which was entrusted to the Phelips family, for the purpose of applying income arising from it to "teaching four poor children of Yeovil and four of Yeovil marsh, in reading, writing and casting accounts" which suggests that the old school was in existence then. In 1707 Martin Strong, the vicar of Yeovil, began a public subscription in order to endow a charity school "for 20 poor boys to be taught and closed after the manner used in and about London". 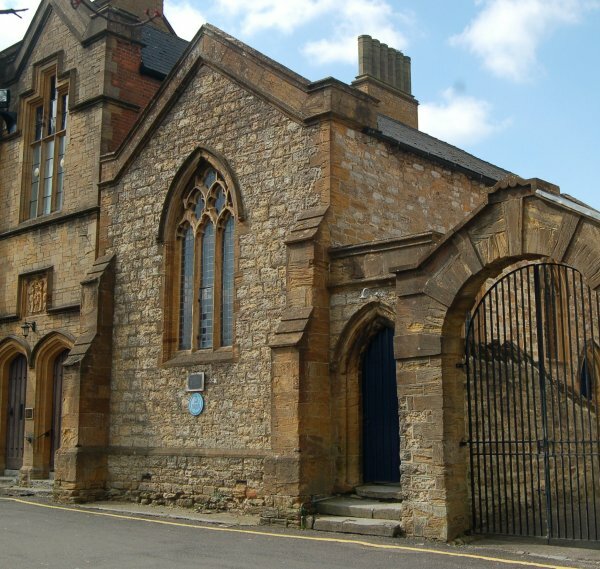 The Yeovil Charity School, also known as the Free School, the Latin School, the Charity Grammar School and later the Blue Coat School, opened in 1709 providing a free elementary education for children up to the age of 12 or 13. This, it was claimed, was "the first in all this part of the world". In his will of 1720 Martin Strong stated "I do give to Edward Phelips of Preston, Esq., £40 (around £80,000 at today's value) to the Intent and Entrust that he pay the said £40 in six months after my death to the treasurer of the Charity School of Yeovil to the sole benefit of the poor boys of the said school, but if ever the said school should fail or cease, which God forbid, then my will is that the said £40 be given and apply'd to the use and benefit of Mr Woburn's Almshouse in Yeovil, but if I should happen to purchase a piece of land and settle it upon the said Charity School in my life time, which I fully design, then my will is that the aforesaid £40 shall not be paid to the School but go to my Executors hereinafter named (daughters Edith, Elizabeth, nephew James Strong of Hinton St George)." That a Treasurer and Six Trustees be chosen yearly for the Charity School. That the Master have sixteen pound per ann for teaching 20 poor Boys pd. to him Quarterly. That the Boys be chosen by the Majority of the Subscribers, and that Each Boy be not under the Age of six, or above the Age of eight years. That the Treasurer and Trustees meet at the School-house the last friday in every month, and the Subscribers the last Tuesday in every quarter. That the Boys be taught to work as soon as may be. That this School be govern'd by the Printed Rules and Orders for the Charity-School in London. The first twenty boys chosen were - Henry Perry, John Hodges (placed with Giles Hodges 1711), Richard Luce, John Hart, Thomas Lockey, Lawrence Bernard, John Bartlet, Thomas Ostler, William Butts, Francis Denman, Mathew Chipman, Jethro George, William Hobbs, Edward Sherry, Richard Cheney (left because of sickness in 1711), Richard Hull (ran away in 1711), Thomas Marler, Thomas Shean, Richard Eyre and Samuel Bernard. The Trustees of 1708 were William Phelips, John Prowse, George Cox, John Clarke, John Mourie, John Old, Edward Boucher, Thomas Freke, W Waddon, John Darley and Richard Freke. In 1711 several of the boys had finished their education at the school - William Butts, Henry Perry, William Hobbs, Per Torr, Thomas Shean, Petro (Jethro) George, John Hodges, Thomas Ostler, George Hockey, Lawrence Bernard, Jonathan Hart and Samuel Bernard. These boys were replaced by Thomas Hutchings, John Pawly, William Hulet, Jos Chamberlain, Francis Butts, Thomas Hodges, Richard Wills, Jon Pardy of Preston, Jon Hoskins, Andrew Hammond (who was expelled in December 1713), Jon Wills, Jon Monk and Thomas Bartlet. John Nowes, esq. by his will dated 8 August 1718, devised his manor of Lee, and all his real estates within the Parish of Romsey extra, in the county of Southampton (sic), to three trustees "to apply £120 per annum in the decent clothing and schooling 40 poor boys under the age of 13 years, whose parents are of the communion of the Church of England as by law established, to be put out to such school or schools as the trustees should think fit; at which schools the said boys should be kept under strict discipline, and taught and instructed in the rudiments of the Christian religion, and reading and writing well the English tongue, learning the Catechism and frequently reading the Bible and Book of Common Prayer, according to the usage of the Church of England, and also in trust, to apply £30 yearly as a fund for binding out apprentice such of the boys as should faithfully and honestly have served their apprenticeships, in such manner and by such proportions as the trustees should think fit. The said boys constantly to wear, during the time of their being at school, gowns and caps made of blue cloth.... vacancies should be filled up by the trustees, £3 per annum being designed for schooling and clothing each boy, and the number of 40 to be kept up." Much of the children's education focused on the Bible and the Book of Common Prayer and once they had reached the age of 12 or 13 they were further helped to find apprenticeships. Mostly funded by endowments and subscriptions, the school provided a blue cloth uniform for the poorest pupils. The Churchwardens' accounts for 1732 show a payment of £3 7s 5½d for "Mr Seward's bill for work done about the School House". In 1753 John King was paid £3 7s 3d for teaching the boys from 29 September to 13 February but in 1754 John Boucher Hodges was appointed Master. The origins of the Chantry being used as Yeovil's first school were confirmed in 1820 in the House of Commons where a report by the Church Commissioners into the charities concerning St John's church was discussed - "There are traces of the existence of a school in Yeovil so far back as 1573; for The School, it is stated in a memorandum, purporting to have been taken from the antient accounts of the churchwardens, and made by a person who had served the office of churchwarden, that in that year a building in the church-yard, which had formerly been a chapel, and which was part of the church lands, had been converted into a school-house, at the expense of £12 13s 4d which had been borne by the parish. The accounts for 1573 are not forthcoming, but in those of 1577 is an entry, stating that 4d had been paid for a new key to the school-house." In 1791 Collinson wrote "Here is also a charity-school, in which poor children are educated and clothed, and afterwards put out to useful trades." "There is also another School in Yeovil, - and a very important one it is - of which there are traces so far back as 1573. Mr. Andrew Everton, who had been a Churchwarden, made this statement: that in the above year William Ford and Thomas Phelps being Churchwardens, a building in the Church-yard which had formerly been a Chapel and which was part of the Church Lands, had been converted into a School-house at the parish expense and the cost amounted to £12 13s 4d, which had been borne by the parish. In the accounts of 1577 is an entry stating that four pence had been paid for a new key to the School-room. There is no other evidence of the establishment of a Charity School, previous to the 18th August 1707 when a subscription was set on foot for that purpose and it was resolved that a treasurer and six trustees should be chosen annually. The building was conveyed by a feoffment deed on the 12th March 1708 to Edward Phelips and others in trust for the use of the parishioners of Yeovil, to be made use of for a School-house to educate children or for such other charitable uses as to the said parishioners should seem most meet. Several donations and bequests were made in aid of subscriptions, particularly a bequest of £100 by the will of William Phelips, Esq. of Preston Plucknett. On the 8th February 1714 the trustees were enabled to lay out £140 in the purchase of a dwelling-house, orchard, &c, at Marsh within the parishes of Yeovil and Pitney. These lands let at about £18 per annum. Merrel Symes granted other premises in 1708 and 1710 for the Charity School in Yeovil, then lately erected. John Nowes, by his will, 8th August 1718, devised his manor of Lee and all his estates within the parish of Romsey extra in the county of Southampton, to three trustees and their heirs in trust to receive rents and profits and to apply £120 per annum in the decent clothing and schooling of 40 poor boys, under the age of 13, whose parents are in the communion of the Church of England, as by law established, to be instructed in reading and writing well the English tongue; learning the Catechism, and frequently reading the Bible and Book of Common Prayer, &c. In November, 1721, it was decided, by a decree of the Court, that Jane Nowes, the daughter and heiress of the testator, having considered the matter of her father's will, did desire that ten boys should be taken out of Preston Plucknett and Alvington, and the parish of Brympton, - Alvington being the place of her father's nativity, - and the town of Yeovil, near adjacent; and the other ten out of the city of New Sarum, and the other twenty out of the town of Romsey, where her father lived and died.... Out of this estate there is annually remitted to the schoolmaster at Yeovil for the clothing of ten poor boys of the parish of Preston Plucknett and of Alvington, as mentioned in the donor's will, £20; for their education, £10. £60 a year were allowed as a binding fund for binding out as apprentices such poor boys as should attain the age of 13 years. Frances Cheesman, by a will, dated May 1711, proved 6th November 1719, gave yearly to Mr Hibbard, the schoolmaster of Yeovil, the interest of £150 so long as he should teach school there, and after him to his successors if they should be learned enough to instruct and make young men fit for Oxford or Cambridge. Edward Boucher, by his will dated 28th April 1725, gave a close of pasture land called Beer's Close in Yeovil, the rent to go towards clothing four poor boys of the parish of Yeovil in blue; also for binding them apprentices and in augmentation of the master's salary. The will of Thomas Cheesman, linman (draper) dated 20 March 1730 stated "I give unto the Latin School if any man is possessed of it that teaches boys and is rightly grounded in the Latin tongue the sum of five pounds to be paid him yearly for the teaching and instructing three boys." Mr John Boucher Hodges was schoolmaster from 1754 until his death in 1803, aged 73 and in 1804 the Rev. Thomas Tomkins was appointed master. In 1804 the floor of the upper room was removed and the premises rearranged and on the 18th January of the same year a subscription was entered into for the support of a master to teach the English and Latin languages and to enable him to employ an assistant to teach writing and arithmetic. The following are some of the names and the sums subscribed - W Phelips gave £10 10s, John Goodford £5 5s, John Daniel £5 5s, Edward Batten £5 5s, John Hooper £5 5s, Peter Daniel £5 5s, William Cayme £5 5s, WL White £5 5s, John Greenham £5 5s, Edward G-- £5 5s, George Watts £5 5s, John Hatchings £5 5s. Each subscriber of £5 5s had the nomination of two boys, to be educated free of expense in English, Latin, writing and arithmetic; and every inhabitant of Yeovil had a right to send a relation to the school, on the annual payment of one guinea, provided the whole number of scholars, including the charity boys, did not exceed 80. The whole of the subscriptions amounted to £89 5s. Ten boys are educated at Yeovil, and clothed under the Romsey charity. They are selected from Preston Plucknett and Alvington, in preference to Yeovil. The clothing given consists of two shirts, a blue coat and waistcoat, a pair of leather breeches, a blue cap, two pair of bands, two pair of stockings, and one pair of shoes. Each of the ten boys, on attaining the age of thirteen, was.... entitled to an apprentice fee of £5. Four boys are educated, and are also clothed every third year, in respect of Beer's Close. Sixteen boys of Yeovil are educated, in consideration of the rents of Coppett Hill, of the house and land at Marsh, and the dividends of the South Sea stock and the turnpike deed-poll, amounting in the whole to £47 12s., from which there are deductions, amounting on an average to £9 per annum, for repairs of the school-house and windows, firing, pens, ink and paper. The mode of admission is exceedingly simple. The parents apply to the school-master for the admission of their children into the school and, if there be vacancies, they are uniformly admitted, provided their parents belong to the communion of the Church of England." By the time of the 1846 Tithe Apportionment the Charity School only retained ownership of four properties; a pasture field called Milford (Parcel 1014) rented by Thomas Dampier, another field called Coppett Hill (Parcel 1317) with Charles parsons as tenant and Parcels 1299 and 1301, both described as 'House, Garden & Orchard' and both with John Saunders as tenant. However, mismanagement and misappropriation of the funds of the Charity School was part the Yeovil Charities Scandal at the beginning of the nineteenth century. In 1888 the Chantry ceased to be used as a school and writing in 1922 WC Clothier recalled "I was then (1853) a boy nine years old, at the Grammar School under Parson Langdon and Mr Woodman. The school building was attached to the west end of St John's Church, but I fear that the last of my school mates alive was the late Mr Fred Ewens of Penn Hill." 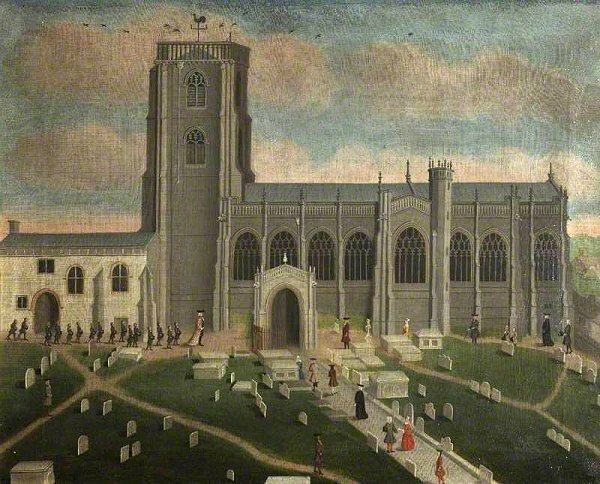 This oil painting dates to about 1750 and shows the Chantry, at left, in its original position by the church tower. In front of the Chantry are the Chantry schoolboys in procession behind their master, on their way to church. This painting was sold for £4,000 as part of the Newton Surmaville house sale in October 2007. 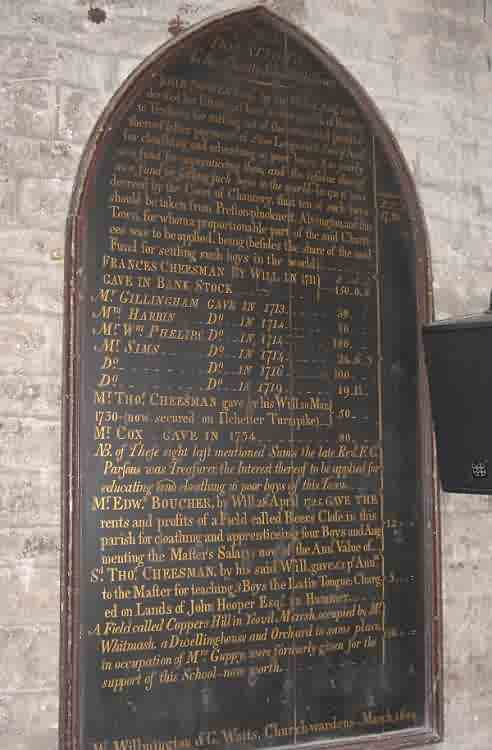 One of four charity boards in St John's church. This board, dating to 1804, lists the donations made to the Yeovil Charity School. 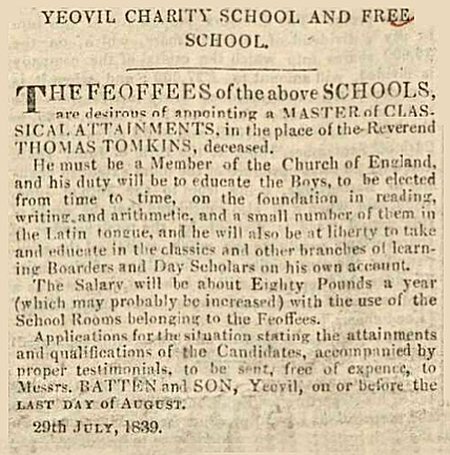 The advertisement for a new master placed in the Sherborne Mercury of 12 August 1839 following the death of Rev Thomas Tomkins. The Chantry, photographed in 2013.